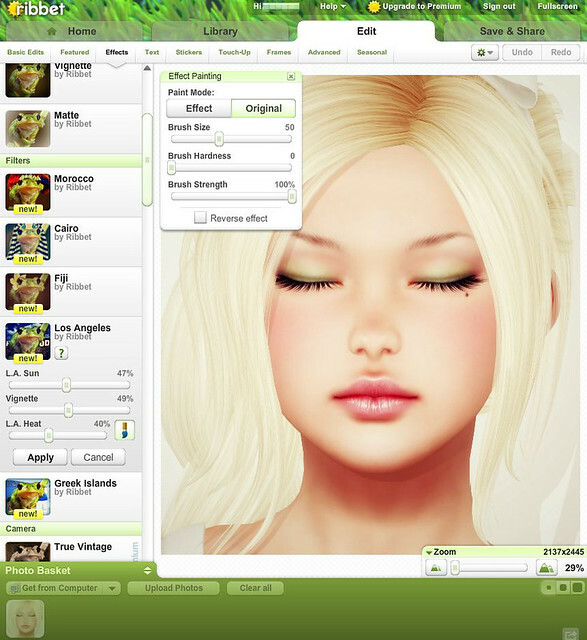 Today my Plurk friends told me about a new online photo editor called Ribbet! Last year, when Picnik integrated with Google (closed), a bunch of us (former Picnik addicts) went to Picmonkey. I liked Picmonkey a lot, I even signed up or a whole year of premium service. However, it lacked one really important feature that Picnik had, which is the ability to upload directly to Flickr, instead of having to save the image first to hard drive, then re-upload to Flickr. I took Ribbet for a test drive today, and I’m already a fan. It has everything that Picnik had, and more! It is Picnik 2.0! All the premium features are FREE now (that may change soon), but I would happily splurge on the upgrades just cos I love online photo editors for simple blogging edits instead of always relying on Photoshop. Are you using any online photo editors? If so, which one? You should look into photoshop actions if you haven’t already. A lot of them you just press one button and it does all the work for you by a single click of the button. It’s pretty neat. I’m kind of a ps newb. I know just enough to make my ads & site banner, lol. Is this site paid? It’s really easy! You literally press the play button in the actions tab and it does all the work. And yes it is paid for some of the nicer actions, you get a lot of them, but you can find free ones too! hi, thanks for the tip! i just few weeks ago found Pixlr Express, http://pixlr.com/express/ which for me is perfect. and it is totally free and very easy and fast to use. I’ve been using Ribbet for a couple of weeks now and I love it, it’s basically the same as Picnik was, which I was a really big fan of! Has it clone tool? Sometimes it is a bit of clipping, or those pesky grid lines… What viewer do you use now? If you say the official viewer, how do you manage? Do you use a customized skin? I think the official viewer feels so clumsy compared to Firestorm. I don’t find most of the handy photo tools in it. NVM, I looked it up myself. I see it is in premium, means you have to pay for clone tool. And I registered so I can get all the exstras for free a limited time… *facepalms*. I guess it is too early in the morning for my brain. Thank you so much, I really, really missed Picnik! Thank you for letting me know about this site. I think it’s awesome. I’ve already reworked a new SL profile photo using it! Thanks a lot for that info! I was big fan of Picnik. Now I use mostly Ipiccy or PhotoScape, but I’m really looking forward to test Ribbet. Just a nice and bright Windlight setting, I don’t really do anything special. It hasn’t got layering, and that’s what I need most of all for my photos. I liked PicMonkey when it was free, but I stopped using it when they started charging for it. Google Picasa will do most of the things PicMonkey does, and for free. For everything else, Photoshop!